We at Sardella’s Pizza know that you can’t make great pizza without great people. And we happen to think we’ve got a lot of great people working for us to bring you the best pizza in town! So we’d like to give a nod to a couple of those great people who make Sardella’s your favorite pizza place. 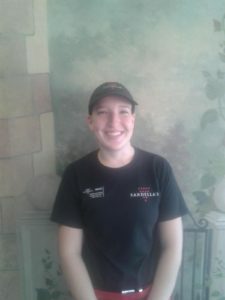 She’s been with us for over three years, but Brooke Olive still loves working for Sardella’s! She’s currently working the front counter at our store at 43rd Avenue and Cactus, though she’s tried her hand at most of the other positions in the store as well. Born in Gallup, New Mexico, Brooke grew up here in Phoenix. She loves the outdoors, enjoys kayaking, rock climbing and going camping with her boyfriend and their dog. When asked what made her want to work with us, her answer was pretty straightforward: it was close to home. The proximity may have been nice, but the people she works with have been the reason she keeps coming in day after day. As far as her favorite pizza, Brooke goes for sausage and pineapple for the combination of sweet, tangy and a little bit of spice. We’ve all heard the story about somebody joining the military on a dare, but a pizza place? According to Eva Marie, that’s exactly what happened! Her daughter was working for us and dared her mom to fill out an application. More than 18 years later, Eva’s still with us! 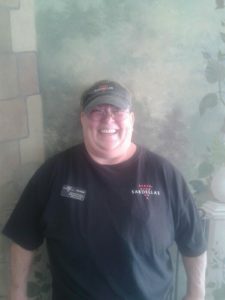 She works primarily as a delivery driver at our store at 43rd Avenue and Cactus, but is able to take on other tasks as necessary. When she’s not delivering for us, Eva enjoys cooking, crochet and reading. Originally from Rockdale, Texas, Eva describes herself as funny and full of life. When asked what she likes about Phoenix, she says that the weather is one great thing, but the easy access to the mountains is another one altogether. When it comes to her favorite pizza, it’s more notable that she mentions the one kind that is not her favorite: pepperoni. More for us, then! These are just two of the wonderful employees we have at Sardella’s Pizza, and they’re part of why we’ve been a community staple for over 20 years. Come on by our store at 4212 W. Cactus Rd, or one of our other three Phoenix pizzeria locations, and enjoy our award-winning pizza, wings and pasta served by our amazing team of employees.